What is that 'Frame Saver' stuff? It coats the frame internals thus protecting them whilst also treating any corrosion thats inside the tubes. Looks great Mark. Like the idea of building it how you'd have wanted bitd. Trying the same with a project of mine. I find it quite hard to keep to what I wanted back then instead of the default top end build now. Looking forward to seeing the results. BTW, is project No 8 anything to do with the Ti you mentioned at Gisburn? Your right it will be very diifficult to get this right as I liked shite stuff as well as good stuff bitd. I guess it was almost 'what was in the bike shop window' most of the time, but i'll keep it retro and hopefully use the more elegant parts from the era. Tbh, I was only the wheelset away from having all the parts for this collected, i'd then have started building straight away. Project No. 8 will hopefully be an alpinestars ti-mega as discussed and that will kidnap all those parts, so the ti-mega really will be my ultimate alpinestars! What can I say... MEGA as usual! 2013 Cannondale CAAD10 Custom Campag Record sub 16lbs! I've decided to carry on with this build so to keep it's integrity. As I say I’ve got almost all the parts, think I’m just missing wheels (come on Giles), brake blocks and tubes. Hopefully all will be with me soon so I can build this into my dream cro-mega. 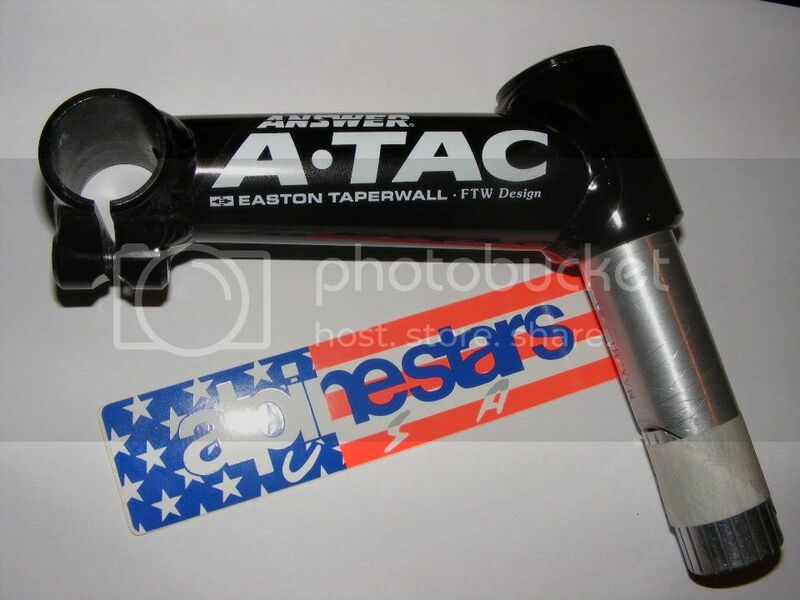 The Answer parts continues with the iconic Answer A-TAC stem. 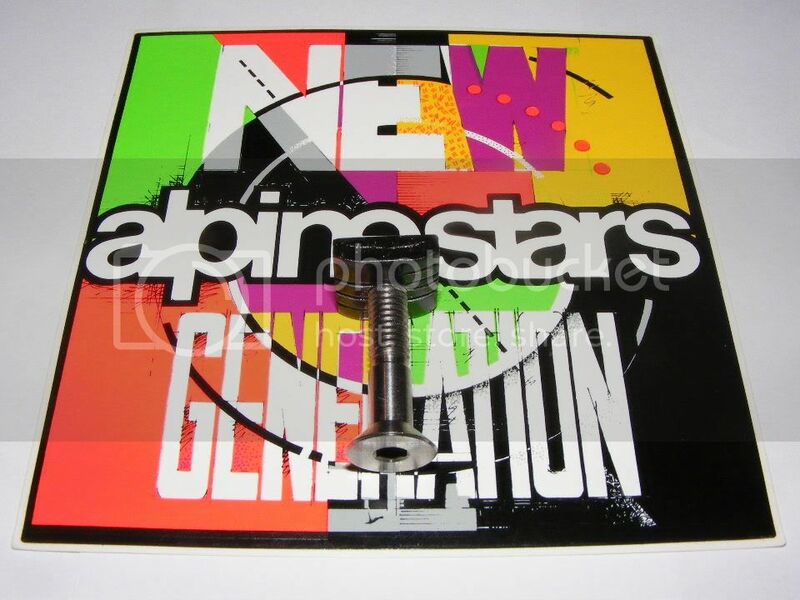 Always harder to get in 1 ¼” flavour but I was extremely lucky in locating this one from the forum for a bargain price of £10 posted. I’ve been very lucky here as not only is it 1 ¼”, but in exactly the right reach (135mm), angle (17 degrees) and colour (gloss black). The stem arrived in near perfect condition, with the only blemish being slightly peeling decals. I’ve replaced these with new Gil_m replacements and I reckon this stem is so good it could now pass as NOS. As my ultimate cro-mega has a thirst for Answer parts, Answer Hyper Lite bars are the way forward here. 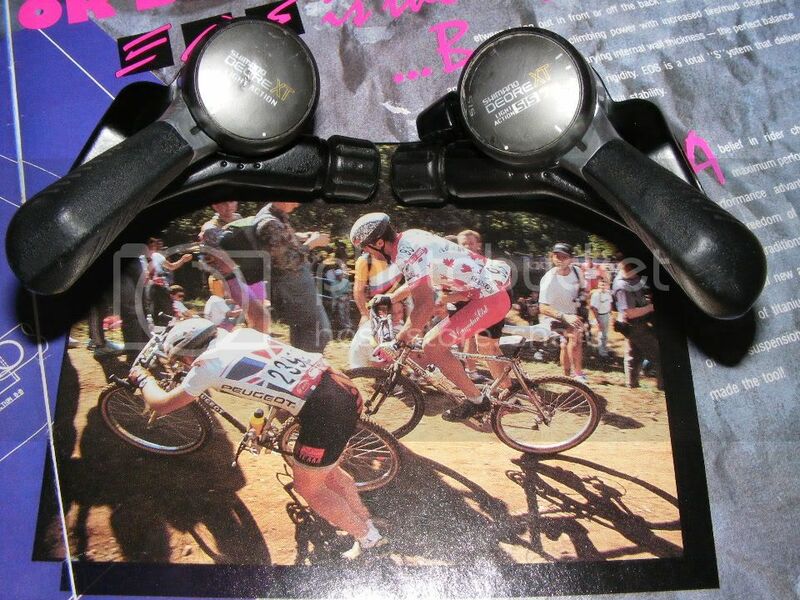 I had a pair on my cro-mega DX and I they were great. This set I scored off the forum but had to pay a handsome sum for them. For the price I paid I was expecting absolute minters, but these aren’t as good as I hoped and imagined. One end is crimped from a fall and they have several scratches and blemishes. Fortunately the bars are too wide for me, so I can trim them a little to remove the crimping and I have my fingers crossed that when all the controls are mounted the scratches and blemishes will not show. 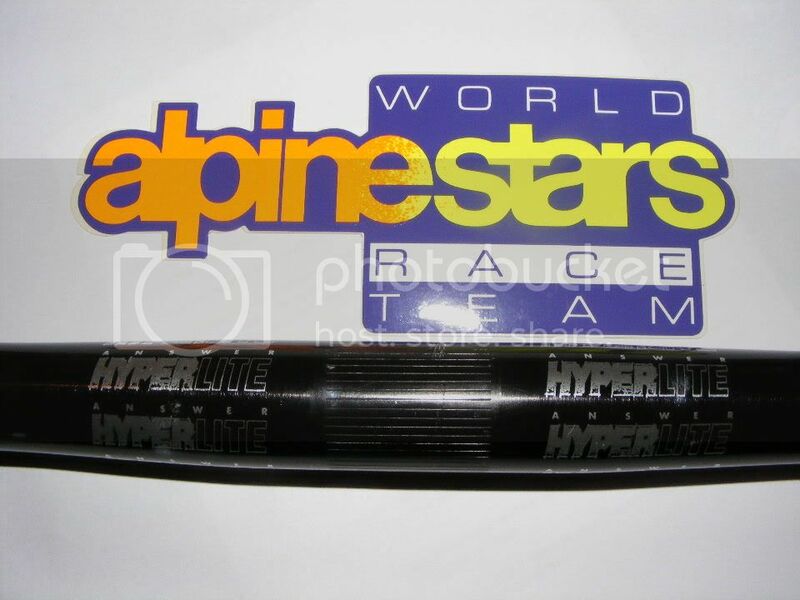 I had these Answer Hyper Ends set a side for my Orange Clockwork XTR build last year. At the last moment I changed my mind about them and went for X-Lite ends instead. Thus, they had remained in a primed state ever since they had their dents filled with filler. They have now been sprayed in gloss black and lacquered using rattle spray cans. Titanium bolts replace the rust prone quill bolts. ODI Tomac Attacks are a personal favourite of mine. Truly retro, yet great comfortable performers. As I’m using bar ends they have been cut down to create some space on the bars and allow fitting of the Hyper Ends. Ideally I’d of liked a set of Answer Aggressor grips but I’ve struggled to get a set, especially in a colour that suit’s this build. The grips complete the elegant all black front end and as with all my grips, they’ll be secured using Renthal grip glue. Wow bud I'm loving this. very inspiring this, dead tempted to have a painted rebuilt bike but unlike this quality find it would mean defacing some natural patina. keep going dude, you've got doing these down to a fine art now innit. Cheers Mark, seen as as asked so nicely here's the next installment. 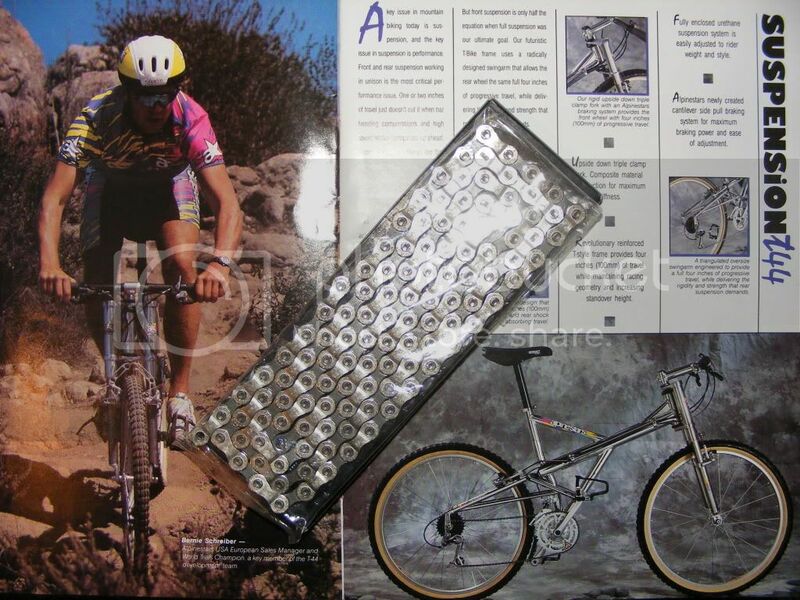 Shimano Deore XT from the 91-92 era has been sourced. I did think long and hard about using M900 XTR as I’ve used this on other builds and love the quality and performance. In this instance I wanted to use Deore XT as bitd for me XT was the pinnacle. Yes, XTR had appeared in 1992, but tbh XTR was such a world away from my piggy bank I can’t remember ever lusting after it in the way I did XT. The colour scheme was just perfect on this era of XT group set too, the black and gold just looked the business and the quality was excellent . I hadn’t seen much of this era XT for some time until I was out riding with Dr. S around Dalby and saw the XT gear on his Fat Chance, it looked as cool in 2009 as it did all those years ago when I was an envious schoolboy dreaming of owning it. 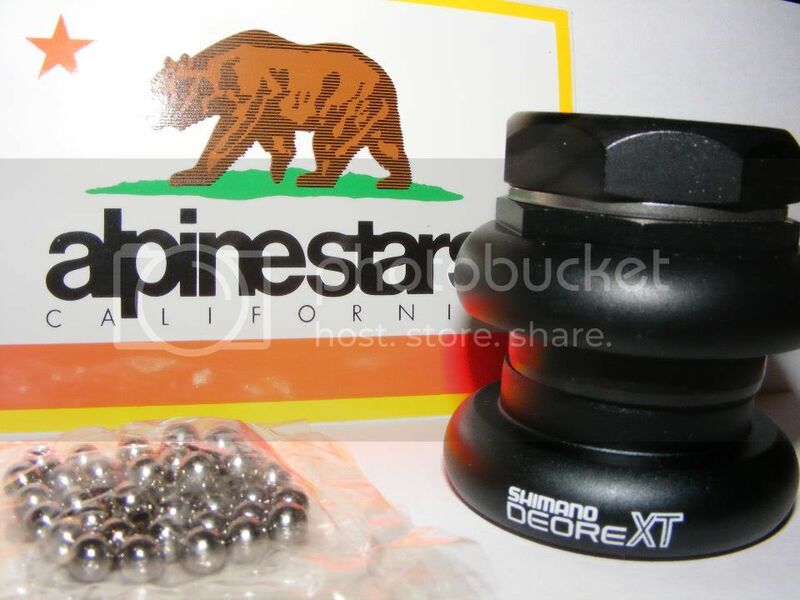 A Shimano Deore XT M737 threaded headset was eventually sourced after quite a search. Again the quirkiness of the 1 ¼” set up led to me paying a premium price for this part. But I had to have it to get the spec of this ultimate cro-mega off to the right start. I was surprised to find that the headset uses loose bearings instead of caged ones. I must admit I’ve not had the experience of such a set up since bitd. The temptation to replace the loose bearings with caged versions is strong, but at this time I’ll run it as it was intended. As no grease was supplied with the headset I’m using some top quality Shell Retinax HD2 bearing grease to keep things moving freely. Shimano Deore XT M732 thumb shifters are the connoisseurs shifter of choice. With precision shifting every time and period looks, these are the only option for this build. I’ve stripped this set down and serviced the internals, the brackets were starting to show their age so rub down with wet and dry and a rattle can spray job in satin black freshened them up. 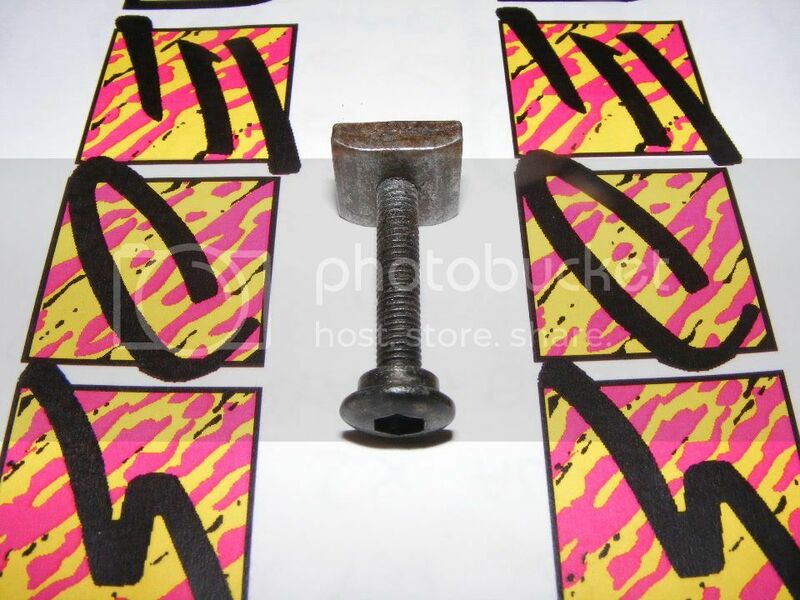 Titanium bolts give a rust free durability and keep the weight respectable. My set suffer for the odd little dent to the top caps, but these shifters are so reliable it seems daft to pay big bucks just for aesthetics. 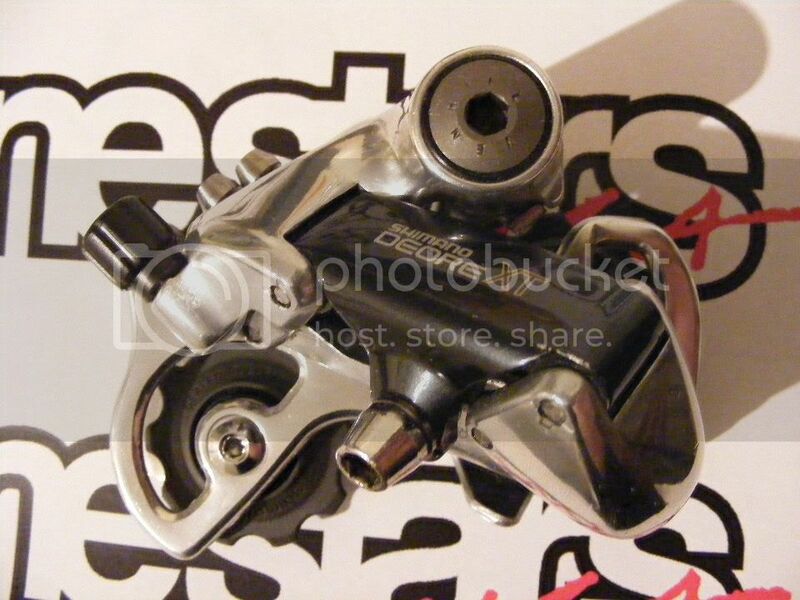 Alpinestars with curved seat tubes use a bolt on design to attach their front derailleur. The derailleurs used are the endless band type with the bolt and band removed, a longer bolt and threaded retaining piece then secure the derailleur in place. 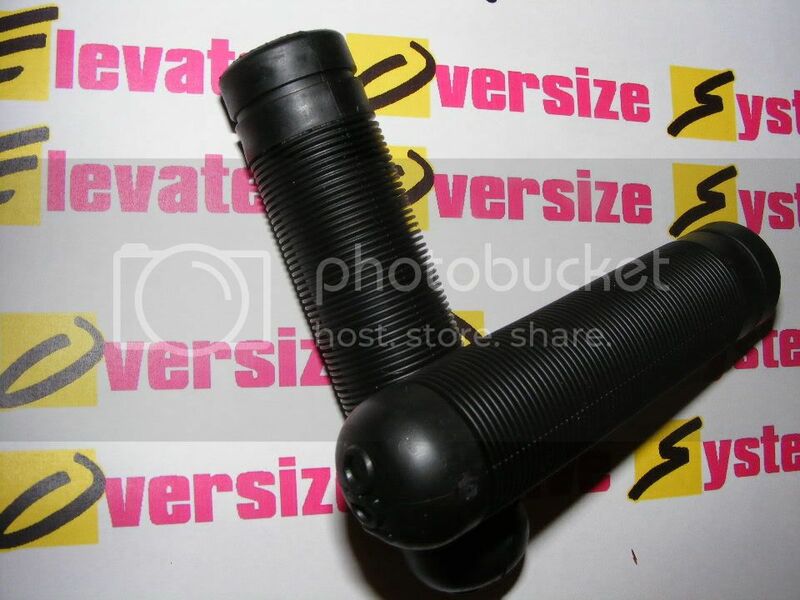 Here is a picture of the original M5 steel bolt and retainer. 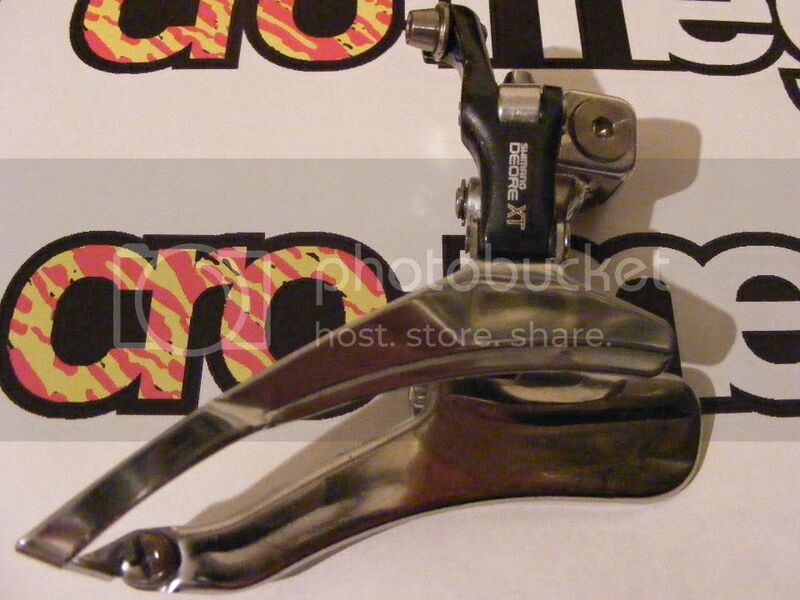 The front derailleur of an elevated alpinestars is without doubt the most fiddly and annoying part of the bike. The bolted on system has a couple of draw backs. Firstly, they constantly come loose and moved and secondly because having the elevated stay above the derailleur means adjustment of the H and L screws is difficult. So I’ve tried to eliminate these problems in this build. To cure the loosening and moving problem I’ve utilised the original threaded retaining piece that came with the frame. The retaining piece has been drilled and tapped to M6, this is so I can run the a larger M6 bolt, this can then handle a greater torque. Thus, a M6 x 30mm titanium bolt replaces the original easy to strip steel bolt, not only should this prove stronger but also be totally corrosion resistant. I have also milled gripping grooves into the threaded retaining piece, thus it can bite into the frame and my new powder coat and hopefully keep the derailleur secure. These will bite into my nice new paintwork and frame, hopefully producing secure fitment. The front derailleur I’m using is a Shimano Deore XT M735 endless band type. Apart from a good clean and service of the derailleur I’ve milled gripping grooves into the back of it, these like those on the retaining piece will bite into the powder coat and frame and hopefully preventing any slipping and moving of the mech. I’ve also removed the original adjustment screws and replaced with M4 x 15mm allen head titanium bolts. These allow me to adjust the derailleur easily using an allen key, thus the fiddly task of poking a small screw driver through the stays is a thing of the past. 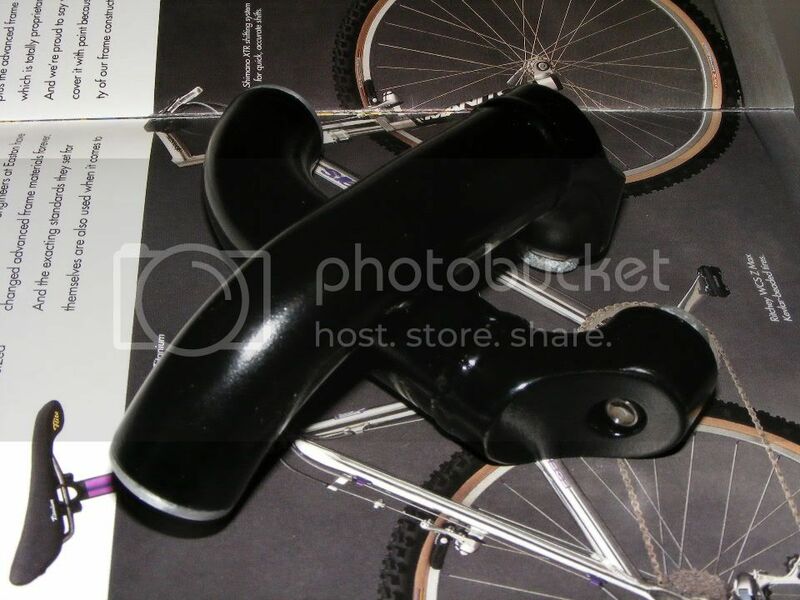 The derailleur will further be secured using a dab of Loctite 638 retaining compound. This stuff is usually used for securing ill-fitting bearings in pump housings and such. I’m hoping my new gripping grooves and extra torque will secure the derailleur adequately, but to make sure I’ll put a dab on both the back of the derailleur and the retaining piece. Belts and braces. The M735 Shimano Deore XT rear derailleur is the classic XT rear imho. I managed to gather this short caged version from the forum and after a through degrease, service and clean it’s a turned into a beauty. Again titanium bolts in the form of a Venhill pivot bolt and span adjustment bolts are utilised. Shimano used the Deore XT M730 cranks for several years and I’ve heard few complaints about them. Yes I could go all bling on my ultimate cro-mega, but I don’t really see the point. The M730 oozes old school looks and functions perfectly. Why splash out hundreds of pounds on bling cranks that function half as well and have a tendency to crack! Mine came with the frame but looked a little worse for wear, so I’ve polished them to a high shine. Firstly I painted the embossed ‘Shimano’ logo with gloss black paint and then rubbed the cranks to a high shine using 400 through to 2500 grade wet and dry paper, a final Autosol polish to finish. The M730 crank set would have originally came with steel crank bolts with shiny chrome caps. The chrome caps looked great when new, but after use often rubbed and looked a cheap plastic mess. With this bike being a rider and with me being somewhat of a fiddler, I’m therefore going to fit self extracting crank bolts. I’m fairly sure these were around in 1991/92, so don’t think i'm messing up the authenticity of my ultimate alpinestars too much by using these. As I’m also looking for simple retro elegance with this bike I’m plumping for plain silver Middleburn self extracting bolts. I know and trust these bolts as this is the third bike I’ve used them on and I’ve covered many miles with them. After a quick wire brush of the threads and a clean they look great. The inner and middle chain rings again came with the frame and after a thorough degrease look to have many hours of riding remaining in them. 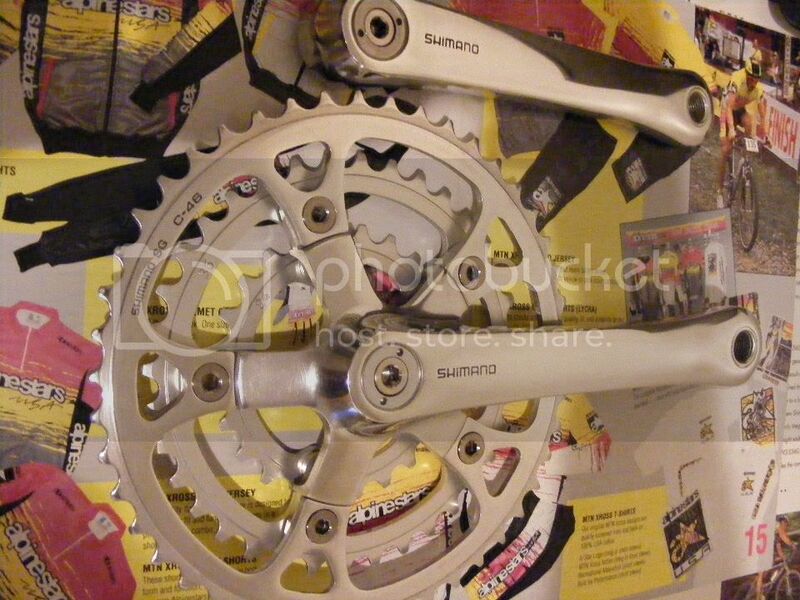 They are both the original Shimano SG ones that would have come as standard and in 24, 36 tooth. The outer ring that came with them was an aftermarket Tioga, I’ve replaced this with an original Shimano SG C-46 that I bought off the forum. All the rings have had a clean with scotch brite and the outer ring has had it’s embossed bits painted in black. I always feel the temptation with chain ring bolts to brighten up a bike with trick anodised aluminium outer bolts from Middleburn or Brand X. 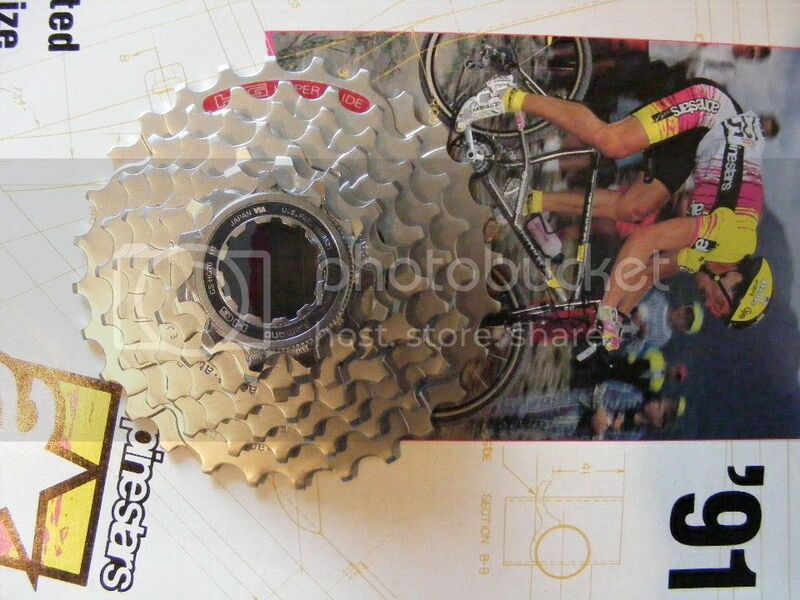 But I’m going to be a bit more conservative and trick my chainset up with natural titanium ones. 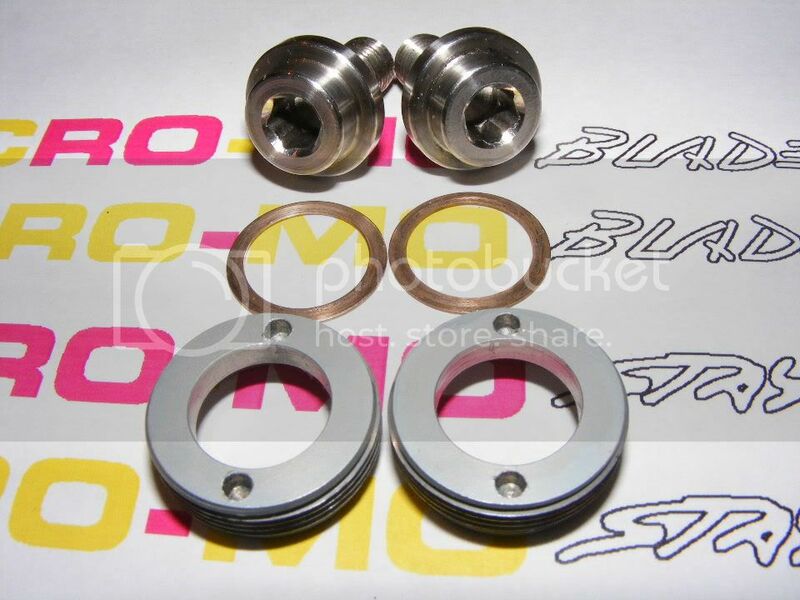 These are the ones from ebay that cost £2.50 per bolt, so really they are excellent value for money in comparison to Middleburns and give a discreet trickness to the build. With being titanium they should also prove stronger than aluminium ones and weights should be comparable for those who watch the scales. The inner bolts I’m using are the original bolts that were supplied with the chainset. They are in good condition and I’ve just given them a clean. The spacers have received a polish. Fully built the chainset looks fantastic, can’t wait to get it fitted to the bike. The correct 7 speed cassette for the 1992 M735 groupset is the HG -90, but these are now getting a tad rare and expensive, especially for NOS. 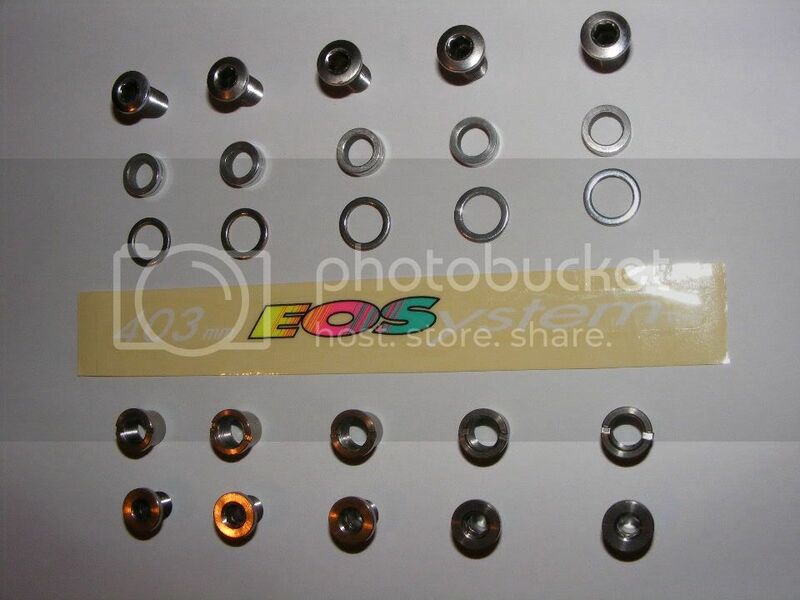 I’m pursuing NOS on this component as this bike is a rider and thus I want the shifting to be spot on and have plenty of life and reliability. So I’ve taken the cheaper option and found a NOS HG-70 11-28 cassette, these were the DX equivalent in 1992 and still offers a quality shift. I recall back in 1992 most 7 speed cassettes were 12-28 and not 11-28 so I’m guessing that this 11-28 cassette is an evolution. I have chosen a Shimano HG-91 chain for this build despite being severely tempted to go with one of Srams fantastic modern chains with power link. 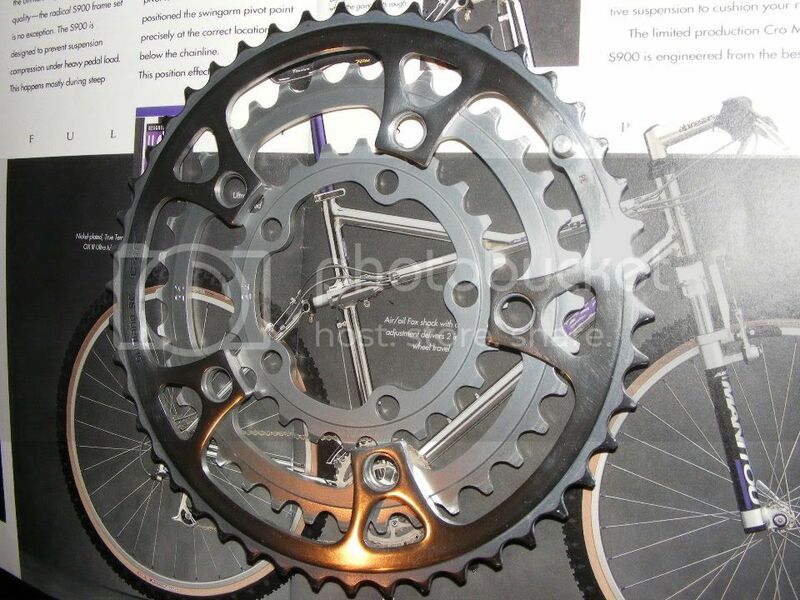 The HG-91 is often thought to be an 8 speed chain, but it actually pre dates 8 speed as it was first introduced into the XT line up in 1991, but it is the narrow design so is really a 7/8 speed chain. I’m running one of these on the Team Raleigh Dyna-Tech and it has been faultless so far running 8 speed XTR, it should perform just as well with this 7 speed XT set up. 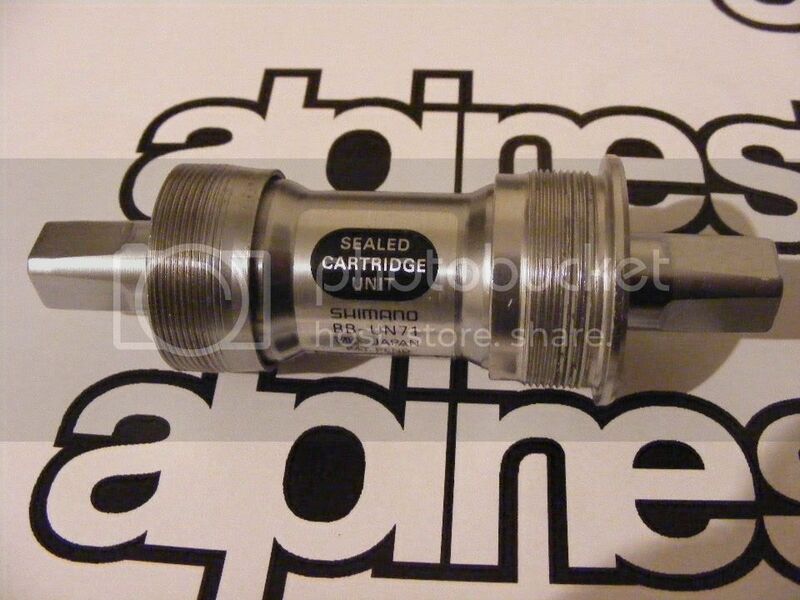 The Shimano UN-71 bottom bracket was first introduced into the XT line up in 1993. Mine is a NOS in 68 x 122.5mm. Feels smooth and is the perfect size for the M730 cranks and the alpinestars English threaded bottom bracket shell. 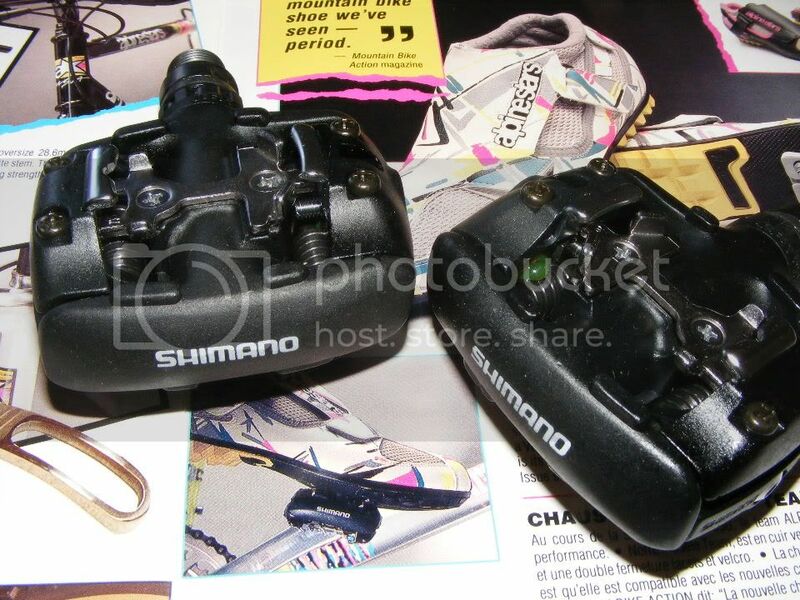 I use the original Shimano SPD pedal on all my retro bikes. The M737 is a bit of a heavyweight I must admit, but I like the fact that there is a large enough platform on the pedal that if you are not clipped in you can still use the pedal, which I find a problem with modern Shimano SPDs. 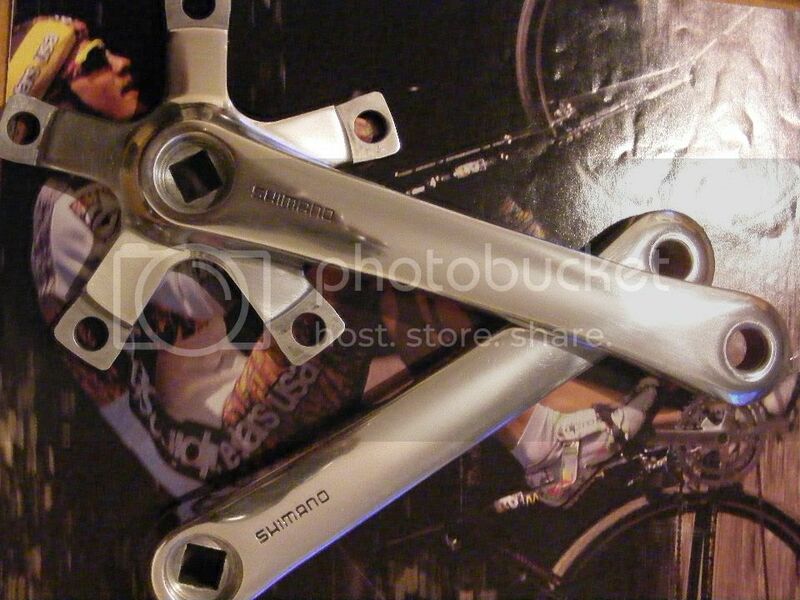 I usually refurbish these pedal and even get Gil to do some reverse Shimano decals so I can paint the logo on, but this time I’ve treated myself to some NOS.